EIA stands for the Electronic Industries Association. The current revision is EIA-310-D. The EIA-310 document is available for purchase at the IHS website. EIA-310 is a specification for what is often called the “standard rack”. This specification standardizes several important features of 19″ racks, such as the Rack Unit (RU or U), vertical hole spacing, horizontal hole spacing, rack opening and front panel width. The specification also sets tolerances on each of these dimensions. The EIA-310 specification has been the 19″ racks standard for equipment for 50 years. Despite this, RackSolutions believes that the items that the specification does not cover is the real reason for the industry wide incompatibility we now face. Rack features such as hole type, rack mounting depth, front and rear space, and obstructions between front and rear rails are the cause of real rack headaches. Vertical hole spacing is defined as a repeating pattern of holes within one Rack Unit of 1.75″. The hole spacing alternated at: 1/2″ – 5/8″ – 5/8 and repeats. The start and stop of the “U” space is in the middle of the 1/2″ spaced holes. See the diagram below. The horizontal spacing of the vertical rows of holes is specified by EIA-310 at 18 5/16″ (18.312)(465.1 mm). This dimension is not well maintained on some racks, causing problems with equipment installation. Many manufacturers use equipment mounting slots instead of holes to allow for variations in this dimension. The opening in the rack is specified as a minimum of 17.72″ (450mm). 2Post or relay racks tend to have a larger than normal opening, as do many other racks with threaded holes. Square hole racks tend to be very close to the minimum opening. The only dimension on a 19″ rack that actually measures 19″ is the width of the front panel of equipment. This entry was posted on Thursday, October 11th, 2007 at 10:40 pm	and is filed under Popular, Terminology. You can follow any responses to this entry through the RSS 2.0 feed. You can leave a response, or trackback from your own site. Horizontal Spacing. 465 mm = 18.307″. Yep. 18.312″ (18 5/16″) = 165,10448mm. I’m sure they rounded it off. However, the EIA-301 RevD states 465mm. The older EIA-301 RevC uses 18 5/16″ (18.312″), so you’re both right. conform with U.S. Public Law 100-418. I’m sure this means rounding off. Racks and Panels. It is compatible with the IEC 25 millimeter practices…. Whatever 25 millimeter practices are. 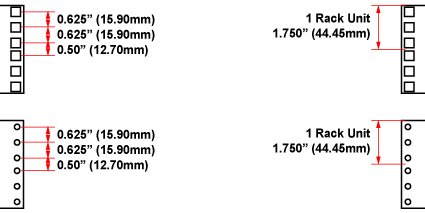 Is that different than 25.4 mm = 1 inch? Actually, the ‘correct’ mm to inch Conversion Standard is the inverse of .03937″ (=’s 1mm)… Therefore the EXACT inverse is actually: 25.400050800101600203200406400813, or 25.40005 for short!!! Multiply any ‘inch’ number by the Conversion factor of 25.40005 and you get the mm equivalent, and the opposite goes by dividing the ‘X’mm number by the Conversion factor to get the actual inch equivalent… -Can you tell I’m a Design Eng’r?! As _currently_ defined, the inch is 2.54 cm _exactly_. When the US congress adopted the meter as the standard of measure (in the mid 1800’s), it also adopted the standard that a yard was exactly 3600/3937 of a meter, which made the meter 39.37″ and the mm 0.03937″ as Joseph states. However in the mid 1900’s the inch was _redefined_ to be 2.54 cm. This leads to there being two different definitions of the foot in common use. The ‘survey foot’ uses the old definition. Y cual es el estandar del calibre de los parales para los Rack´s ???????? Mr. Castelino is wrong here, Mr. Edelson is right. The change from 1/0.03997 to 25.4 by US congress was BECAUSE of mfg facilities around the world becoming a reality. The other countries still using inches at the time almost simultaneously passed similar laws or regulations adjusting their (slightly different!) conversion ratios to 25.4 too. The only people still using the 0.03997″ ratio are a few ultra-conservative industries (such as US surveyors) and people who were taught the wrong ratio from outdated schoolbooks. That said, this article commits the deadly sin of randomly rounding specifications differently and inconsistently. If you want to be inexact, do it consistently. 18.312″ (465.14mm) OR 18.31″ (465.1mm) OR 18.3″ (ca. 465mm) OR 18 5/16″ (ca. 46 1/2 cm). The ca. (circa) in front of 465 mm is needed because 465 looks like a human-chosen exact specification, even though it is not. What is truly missing from this article are actual tolerance ranges for each number (e.g. the center distance of holes should be at least 18.?? ?” (46?.? mm) and at most 18.?? ?” (46?.? mm) but in reality varies between 18.?” (46? mm) and 18.?” (46? mm). A SMART equipment manufacturer will make his faceplate slightly smaller than 19″ – such as 18-31/32″ to avoid any problems with rubbing in tight racks. I once had an AP Audio patch bay that actually measured 19-1/32″ and would not go into my all-steel welded rack (Premier or Bud). I e-mailed the mfg. and they said they saw no problem with it becuase no one else had complained before! Well, not everyone has cheap plywood racks with enough ‘give’ in the sides. This kind of goes along with Jakob’s statement above where he notes “What is truly missing from this article are actual tolerance ranges for each number”. Amen! Is the propoer term EIA or has it been changed to CEA? Good question. We are researching this. Per Wikipedia, EIA was dissolved in Feb, 2011. Thanks for bringing it to our attention. Looking for definitive history of the relay rack dimensions which seems to be lost. Who (what person) or company was the initial designer of the dimensions we use in relay racks, why were those dimensions picked and when and what were the circumstances that started it all. All I’ve been able to find is vague references to the old railroad signaling relays. What happened to the history that created these specific dimensions? We just all have ‘accepted’ them because they are there?? Wish we could help, but we don’t know the origin or history of the 2 post, relay rack either.